Clockwise from lower left, we have a chunk of my wedding cake (Veda's Dundee cake); a Gethsemani Farms fruitcake; Fraters from Holy Cross Abbey; a homemade fruitcake by my friend Laura, made from Fiona Cairns' recipe for Will & Kate's wedding cake (Rich Tamarind Fruitcake); the Sunnyland Farms light and dark fruitcakes; and finally, the vintage 2011 and 2012 white fruitcakes from Robert Lambert. 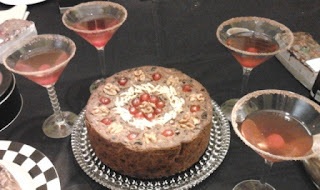 Fruitcake martinis! Recipe courtesy of Wegman's. They were EXTREMELY sweet, and frankly I don't recommend them with fruitcake, but they'd probably be delicious at a holiday party with savories--they actually did taste like fruitcake. (We splashed in a bit of Cointreau, which didn't hurt a bit). We started the tasting, similar to a wine tasting,with the lighter tastes first. I suggested, since so much sweetness might quickly spoil our palates, that we start with the Robert Lambert cakes. They, as usual, were delicious. Pretty much everyone else at the party was a fruitcake noobie, but all were foodies, so this was a nice way to start--there were some comments like "I never expected a fruitcake to taste like this!" As for noting the difference between the two "vintages"--one fruitcake was actually from 2011, and is aged for a full year--I can't say we noticed a huge difference. There were some subtle differences in flavor, but nothing so striking that I would recommend one year over the other. On to the next - I think we went to the Sunnlyand Farms light fruitcake. It was an excellent contrast to the Robert Lambert: sweet, bright, and non-alcoholic. The group really got into thinking critically about the differences, noting the differences in flavor and texture from the previous cake. One observation about this cake was that, where the Lambert cake might be nice in the morning with a cup of coffee, having an almost quick bread texture (or at least a lot more cake), the Sunnyland farms cake was much sweeter, more like a candy, and definitely more like a dessert. And to the next (and I gotta tell you, fruitcake fatigue was already setting in): my wedding cake. The cake itself, I gotta admit, had been through a lot in the past month: it had seen three different states, a wedding, being chopped up, and had been sitting wrapped in plastic for about 3 weeks. It was still tasty and boozy, and the marzipan adds an element of richness, but the fondant was pretty tired at that point, and people found that to be a bit too sweet. Next we got to the beauty in the middle of the table: the Fiona Cairns Rich Tamarind Fruitcake, made by my friend Laura, who is a magnificent baker. As I believe I've already noted in this blog, really, nothing beats a fresh, homemade fruitcake. We all agreed on this, and this was my personal favorite. I took a big chunk home and plan on reviewing the cake recipe in a later post. It was delicious: moist, flavorful, chunks of candied ginger, interesting spices, just really good. Finally, running on fumes, we all took a deep breath and dove into the last one we could handle: the Gethsemani Farms fruitcake. Honestly, I think we could have stopped (hey, fruitcake is rich), but I insisted, because all the previous cakes contained cognac or brandy, and this was our first fruitcake containing bourbon. So, sports that they are, the guests dug into one last slice. One guest immediately did NOT like it--the taste of bourbon did not suit her. Others liked it. My conclusion from all of this? It's kind of hard tasting so many fruitcakes at once! The taste is so rich and sweet that your tongue quickly gets burnt out. At some point our conversation flowed towards what would be a good palate cleanser for a fruitcake tasting--certainly not oyster crackers! Maybe a nice dry champagne would have done the trick (or a shot of bourbon, as I suggested). All the same, I think it was really fun trying different fruitcakes, comparing and contrasting, and I would guess that, although I might not have created any fruitcake addicts, I think we definitely had some fruitcake converts, or, if nothing else, some people who could at least defend the fruitcake's right to exist. You may have noticed that there were a couple of fruitcakes that went uneaten--the Sunnyland farms dark and the Fraters. Yup, we just couldn't--fruitcake satiation. The Fraters were nice parting gifts for everyone, and I suspect the Sunnyland dark will be enjoyed by Sherry, the hostess, along with the remnants of all the rest of the fruitcakes. I have to say that the "after" photo of the table looked very similar to the "before" photo--we were eating very skinny slices, and there was a lot of fruitcake left over. I happily left the party with chunks of a couple of the cakes, and I look forward to reviewing the Fiona Cairns recipe very soon. 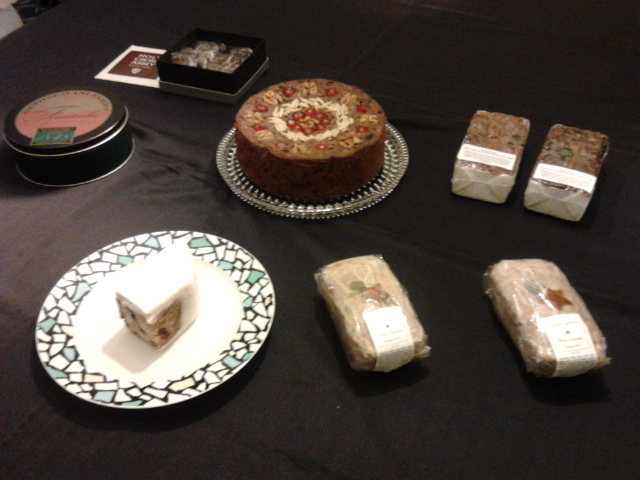 Thanks Sherry and all the fruitcake tasting guests for the good food and conversation--we may have short-term fruitcake burnout, but at least it was from some good tasting cakes! Wowza, I wish I could have been there! I've never tasted fruitcake, and this year I've decided I want to try it. My tastes have changed a lot over the years, and I think I'll quite like it. I look forward to reading more on your blog! Brooke, welcome to the grown-up land of fruitcake! It's cool that you recognize that your tastes may have changed enough to try new things. I would recommend starting with one of the cakes that use dried fruit... Unless you just wanna jump right into the deep end, in that case try a monastery fruitcake!